To surprise guests with a delicious dish, you do not need to bet on delicacy ingredients. From simple products, you can also make a masterpiece. Serve the stuffed eggplants on the table, and the culinary talent will not go unnoticed. Options of the filling are hundreds. Eggplants are harmoniously combined with vegetables, meat, mushrooms, nuts. 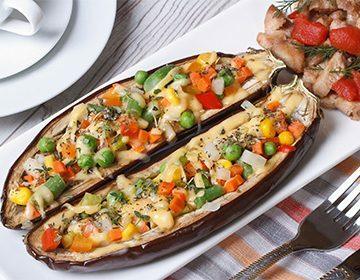 Recipes of stuffed eggplants are so simple that even a novice cook can easily cope with the task. Eggplants in the eastern countries are called "vegetables of longevity" and are recommended for elderly people. Vegetables are rich in substances that are important for strengthening blood vessels and preventing heart disease. 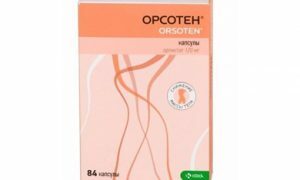 Potassium, phosphorus, sodium, copper, ascorbic acid, vitamins PP and B - enumerate usefulness in the composition can be indefinitely. To eggplants did not lose important substances, they must be properly prepared. The best solution is bake. But simply baked vegetables - it's trite, but if you stuff them - do not be ashamed and serve dinner. Stuffed eggplants can be prepared in a different way - fermented. As fillings use carrots or cabbage. The appetizer turns out spicy, spicy, fragrant. It is appropriate in the everyday menu, and in the festive. In the southern regions of Russia, eggplants are also called "blue". People believe that this name arose because of the violet color of the vegetable, but it is not so. In Odessa, China was considered the birthplace of eggplant (although in fact India), and in Hebrew China sounds like "Sin". Hence the name appeared, which was adopted in some Russian regions. To prepare a stuffed eggplant, you must first prepare the "form". The presentable appearance and taste of the dish depends on this. Make mistakes in the preparatory stage - spoil the culinary masterpiece. To avoid this, remember the four rules. Correctly choose vegetables. For the stuffing, medium-sized eggplants are ideally suited. It is important that the vegetables are young, because with "age" they lose taste, and even become harmful due to the high content of poisonous substance of corned beef. 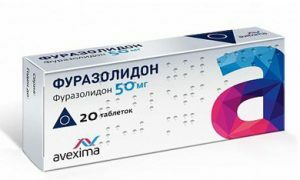 Determine the "age" of the vegetable can be on the skin and pedicels: the skin of young vegetables without wrinkles and stains, the peduncle - green, not dried up. We make "forms". To stuff aubergines for baking in the oven, you need to make them "molds." These can be "boats" or "kegs". "Boats" will be obtained if the eggplant is divided into two halves along and using a spoon to remove the flesh. It is either thrown away or added to the filling. The "barrels" are made by cutting eggplants into several large parts across: a cylinder without a bottom should turn out. The flesh also needs to be cleaned. What kind of "form" to make is a matter of personal preferences. But stuffing "boats" is a little easier: you do not need to think that the filling will fall from the back. Soak it. Eggplant "forms" must be soaked in salted cold water for 30 minutes, and then proceed to the stuffing. The same is done with the pulp, if they plan to use it in a dish. Soaking is necessary to "remove" the corned beef, which is considered a poison. Together with corned beef, characteristic bitterness will also go away. Pulling the boats out of the container, where they were soaked, rinse them under running water and stuff them. An alternative option to get rid of bitterness is to boil the half-cut vegetables five minutes after boiling. Cooking stuffing. While eggplants "get wet", you need to prepare the filling. It's right to stuff the blue ones with raw stuffing, but practically ready. 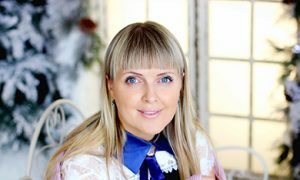 For example, minced meat or mushrooms are pre-fried in a frying pan, and then filled with filling "boats" and brought to the preparedness in the oven. If you use a raw stuffing, then while it is cooked, the eggplant "molds" will be baked. Especially if you use minced meat stuffing. Eggplants with brown color and a large number of seeds should not be eaten. These are overripe vegetables. The concentration of solonin in them can be so high that it will provoke poisoning. 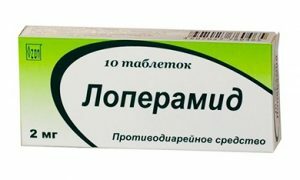 It is manifested by vomiting, diarrhea, abdominal pain and even clouding of consciousness. 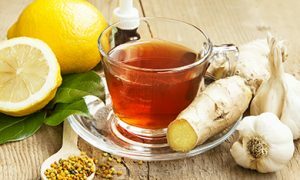 In case of poisoning, it is necessary to immediately neutralize the poison by drinking plenty of water or milk. Most often, the housewives stuff the eggplant with meat, and then bake in the oven. It turns out a full-fledged second course - delicious, fragrant, hearty. It is best to take pork and beef and make minced meat (1: 1), but you can stuff the eggplant with chicken or ham. To the meat ingredient add vegetables - tomatoes, onions, carrots. You can mix forcemeat with any croup, and you will not need garnish. Traditionally stuffed with meat aubergines have a cheese crust, but the cheese can not be rubbed on top. Without spices, a delicious dish will not work. To the traditional set (salt, black pepper) you can add ground paprika, dried Italian herbs, basil, coriander, parsley - a field for culinary experiments is great. Any recipe can be adapted to a multivark. Stuffed vegetables are cooked in "Baking" mode for about 20 minutes. If the power of the "assistant" is less than 860 W, the cooking time will increase by about ten minutes. Features. Eggplants stuffed with minced meat can be served as the main dish, offering to it a side dish - any cereal, spaghetti or mashed potatoes. In this case it is better to prepare "boats". If you plan to serve eggplant as an appetizer, take young, medium-sized vegetables and make small "kegs". Do not throw away the pulp: according to the recipe, it goes into the filling. Prepared "boats" soak by the rules. Flesh of eggplant soak separately. After soaking the "form" pour boiling water and cook for five minutes. Chop the peppers, tomatoes, bulbs in small cubes. 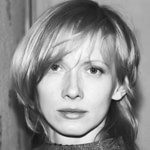 Cut the flesh of "blue". Fry the onions. When it becomes golden, add the mince. Roast for seven minutes. The stuffing should become friable. Add tomatoes, pepper, eggplant flesh. Simmer ten minutes. Add the spices and the garlic passed through the press. Fill the "boats" with stuffing. Top with grated cheese. Bake in the oven for 30 minutes. The temperature is 180 ° C.
When serving, sprinkle finely chopped parsley. 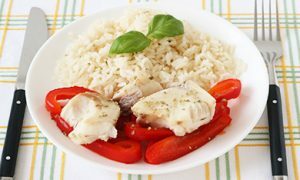 If you add rice to the filling, then you do not have to cook the side dish. The rice is pre-cooked and mixed with roasted minced meat. The flesh of the eggplant is not used, but for the filling to turn out juicy, take more tomatoes. Special flavor notes to this dish will add dried oregano. Features. 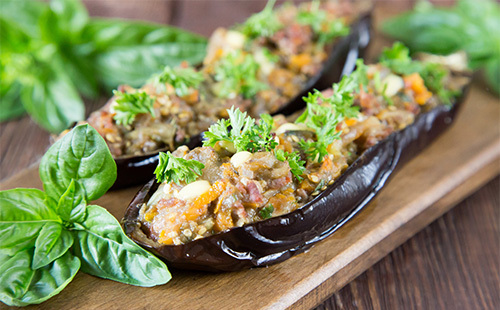 Eggplants with minced meat - "visiting card" of Turkish cuisine. Turkish housewives do not pour cheese on the boats, he interrupts the stunning aroma of spices. A special feature of this dish is a juicy meat filling, saturated with tomato "notes". 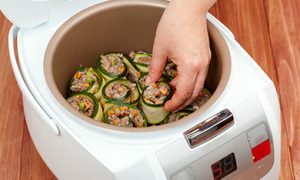 According to the recipe, "boats" are cooked separately, forcemeat - separately, and then brought to the "common denominator" in the oven. But you can stuff raw "forms": then the baking time will increase to 30 minutes. any greens - at will. Prepare eggplants: cut in half and soak in salted water for 30 minutes. Fry garlic in warmed oil, but only lightly. When the denticles give away their fragrance, they are removed. If garlic is burned, the eggplant will be bitter. Slice the onions into cubes. Pour it into butter, flavored with garlic. Pass the minute. Add stuffing. Regularly stirring and breaking up lumps, fry until half cooked. Add spices, tomato paste, broth. Simmer the filling for ten minutes. 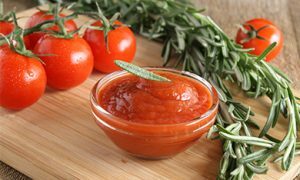 Blanch the tomatoes, finely chop the tomato pulp and send it to the saucepan, where the filling is prepared. Quit it all together seven minutes. Cut the halves of eggplant with a napkin. Fry from all sides. Vegetables should become soft. Do "boats", removing the aubergines from the middle. Fill the "forms" with tomato and meat filling. From above put strips of chili pepper - it will give a pleasant aroma and "ostrinku". Send it to the oven (preheat to 200 ° C). In ten minutes the dish is ready. Serve, generously sprinkled with herbs. If you really want to cook a dish in Turkish, then use minced meat. The alternative is beef. Meat broth can be replaced with vegetable or plain water. Features. The dish is satisfying and beautiful. So you can stuff only "boats", from "kegs" the egg will pour out. On top of the dish you can sprinkle with any herbs. Prepare the "boats". Do not throw away the pulp, it will also go into the filling. Slice the onion finely, fry it until golden. Add the diced ham, eggplant flesh, randomly cut tomatoes. Season the stuffing to taste and fry for seven minutes. Stuff the eggplants. Make a groove in the filling and hammer an egg: one egg per half. Sprinkle the "boats" with grated cheese. Bake for 35 minutes at 180 ° C.
Instead of quail eggs, you can take chicken. But if you use large eggplants, increase the amount of filling, otherwise the egg taste will break other ingredients. Eggplants do not need to be stuffed with meat. You can make a "light version" of the dish and use vegetables, mushrooms, walnuts, cottage cheese as a filling. If the eggplant with meat filling is better served on the table hot, "blue" with a meat middle not tasty and in a cold form. If you have "molds" with thick walls, it is better to boil them first, and then stuff them. Five minutes after boiling will be enough. Preliminary heat treatment is a guarantee that the stuffed vegetables will be baked and softened. Features. 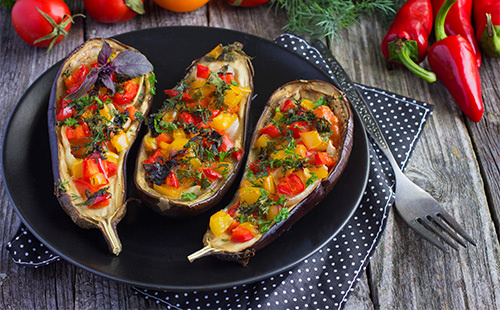 Eggplants stuffed with vegetables are cooked in the oven quickly. 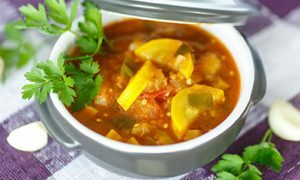 The dish turns out juicy, fragrant, tasty: vegetables have a pleasant color, blend well with each other. The dish is suitable for a vegetarian menu. Prepare the "boats". Do not forget to dunk them, so that bitterness is gone. Arrive in boiling water for five minutes. Rub the carrots. Cut the pepper, onion and tomatoes into small cubes, and pass the garlic through the press. Fry the onions and carrots. When they turn golden, add the remaining vegetables intended for the filling, season to taste. Stew for ten minutes. Fill the "boats" with stuffing. Bake at 200 ° C for about 15 minutes. Serve, generously sprinkled with chopped herbs. 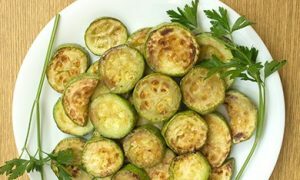 If desired, in the vegetable filling you can add flesh eggplant, zucchini and any greens. If you like spicy dishes - use chili. Features. The recipe for aubergines stuffed with mushrooms suggests the use of mushrooms, but you can replace them with forest mushrooms - the taste will be more expressive. Experiment with seasonings: mushrooms combine well with oregano, nutmeg, white ground pepper. Prepare the "boats". Do not throw out the pulp - it goes into the filling. Cut champignons into plates. Fry, and when the excess liquid is gone, add the onion and hold on the plate for another five minutes. Fry separately the flesh of "blue" and diced tomatoes. Mix the components of the filling. Stuff the eggplants. Send the "boats" into the oven, bake for about 35 minutes at 180 ° C.
If desired, on eggplants stuffed with mushrooms, you can make a cheese crust: the cheese is perfectly combined with champignons. Sprinkle stuffed "boats" with grated cheese before you send it to the oven. Choose varieties that melt well: for example, Edam, Guada. Features. Eggplants with curd filling are an easy dish. Supplement it with a salad of fresh vegetables, but you can serve it with meat dishes, along with a side dish. To guests such eggplant can be offered as a snack. parsley - half a beam. Do the "boats". Do not discard the pulp. Rub the cottage cheese with a spoon, add to it grated cheese, chopped greens and garlic pasted through the press. Season the stuffing to taste. Add eggplant pulp to the filling. Kill the raw egg. Stir thoroughly. Fill the stuffed "boats" bake for 30 minutes. The temperature is 180 ° C.
Cottage cheese stuffing can be stuffed not only "boats", but also "kegs". The egg "glues" the components of the filling: it will not fall out. Features. Dish with a Georgian note. To strengthen it, add coriander to the filling. Hot or cold, aubergines stuffed with nuts are equally delicious. Serve "blue" with nuts as a snack. They can stuff both "boats" and "kegs". Such a filling is often found in eggplant rolls. The recipe assumes that the "molds" are obtained by "al dente". If you like soft vegetables, you can pre-bake "molds" for 15 minutes, and then stuff it and bake it with a prescription. Make eggplants from the eggplant. After soaking, let it sit in boiling water for five minutes. Grind the nuts with a blender or mortar. Mix nuts, sour cream (mayonnaise), grated cheese, add chopped greens, garlic. Season to taste. This is the filling. Stuff the eggplants. Top with cheese. Send it to the oven, preheated to 180 ° C, for 15 minutes. Stuffed eggplants can be made even if there is no oven. Cut the vegetable into circles 4 cm in height. Divide the disc into two, but do not bring the knife to the end: there must be a connection between the plates. Put inside any stuffing, soak the discs in egg yolks, flour, salt and fry. Fried eggplants are much more calories than baked, but you can occasionally be pampered. Delicious not only baked stuffed eggplants, but also "blue" with stuffing, prepared by souring. According to the owners, the fermented spicy vegetables scatter from the table in a matter of minutes. Prepare a snack as simply as baked in the oven "boats", but the time will be more. 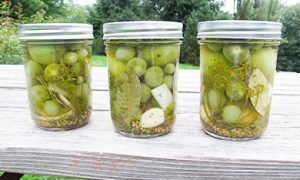 If you want to surprise the guests with sauerkrained stuffed eggplants, remember that for the ferment of vegetables you need time: "blue" can be sampled only three days after cooking. Stuffed stuffed eggplants are a home analogue of vegetables in Korean, which are sold in the market or in the store. The difference is only one - by preparing a snack with your own hands, you will be assured of its quality. Features. Eggplants stuffed with carrots and garlic are spicy. An appetizer can be varied and a festive menu, and everyday. It is important to observe the proportions to get delicious. If you like very sharp snacks, add chili. water - 700 ml (for brine). Prepare the eggplants: remove the tails from the washed vegetables. Make a longitudinal cut on each eggplant. It must be deep - reach the middle of the vegetable. Fold the eggplants in a large saucepan, add half a teaspoon of salt, pour boiling water (the vegetables should be covered with water). Cook for five minutes. Lay the vegetables on the grate, press down with an oppressor. Its role can fulfill the capacity of water. Keep the vegetables under the yoke until they cool. It is necessary that the excess liquid is gone - eggplants become dense, lose bitterness. 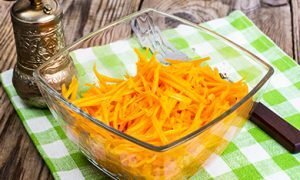 Shred the carrots, add garlic slices to it. Rub the inner walls of eggplants through the cut with salt, lay out the carrot-garlic stuffing. Fold the stuffed aubergines with a dense row in the container. When choosing it, note that oppression will be put on top of the vegetables. You can use, for example, a suiting girl. Cook the marinade: boil 700 ml of water, add the remaining salt, spices. When the marinade is a little cool, pour vinegar into it. Pour the eggplant marinade. Put the vegetables under oppression. Three days stand at room temperature, then send to the refrigerator for a day, and after - try. Quail eggplants are stored in cans, closed with nylon caps. You should eat a snack in a month. Features. Sour aubergines, stuffed with cabbage, will be an excellent addition to puree, vareniki with potatoes, dumplings and meat dishes. When serving, pour the sauerkraut vegetables with vegetable oil - it's so delicious. Wash the eggplants, remove the stems. Make punctures on each vegetable with a fork in several places. Fold the eggplants in a saucepan, pour water (to be covered). After boiling, cook for five minutes. After it has cooled, make deep incisions along the length: two connected halves must be obtained. Prepare the filling: chop cabbage, cut the pepper, grate the carrots. Mix the vegetables. Then squeeze the garlic. Salt and leave for a while to let the cabbage juice. Do it by preparing a brine: add salt to the water, boil, cool. Squeeze out the prepared "blue" juice. Stuff. Wrap the thread so that it does not decay. Fold the stuffed eggplants in a deep bowl. Top with an oppression. Leave to sour at room temperature for two days, then put in the fridge for a day, and you can try. It is possible to stock up with quilted stuffed eggplants for the winter. If you store them under the cap nylon, then in a month they can wander. 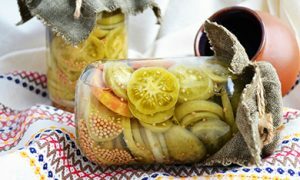 But if you merge the marinade after the fermentation and prepare a new one with vinegar, and use sterilized cans as a container, then you can roll up the snack. In the season, cook stuffed eggplants easily - all the ingredients are available. But what to do when the summer is over? The stocky housewife in the refrigerator always has frozen billets. Eggplants are frozen only after heat treatment, otherwise after defrosting the vegetables will turn into "bitter cotton wool". Before freezing, the "blue" can be boiled, baked in the oven or fired. Do not forget about pre-soaking. If all the rules are met, you can please the household with stuffed eggplants at any time: it will be enough to unfreeze the blanks for sauerkraut or "forms" for baking.